Rene Descartes (1596-1650) opposed the traditional Scholastic philosophy of the universities, which at that time harboured an approach rooted in Aristotelianism as interpreted by the Christian Schoolmen. The Scholastics tended to identify their version of Aristotle with the Bible, maintaining that support for their exegesis could be found in Biblical text. Any refutation of Aristotle was thereby equivalent to blasphemy. Descartes was born at La Haye, near Poitiers. His father was one of the French landed gentry, in a social situation where the clergy held prodigious political power alongside royalty. Descartes studied law at the University of Poitiers, gaining a degree. However, he did not pursue the career of a lawyer. Instead he enlisted in the army, moving to the Netherlands, and later Germany. After leaving military service, he lived a retiring existence in the Netherlands, at places including Amsterdam and Leiden. His major correspondent was Marin Mersenne (1588-1648), a theologian in contact with scientists and philosophers throughout Europe. Mersenne was a basic source of news for Descartes. The latter at first tended to take mathematics as the model for knowledge, an avenue demonstrated in his Rules for the Direction of the Mind. However, his basic field of endeavour is sometimes described in terms of natural philosophy, a subject contrasting with theology. He developed a version of cosmology, employing a mechanistic physics. In 1637, Descartes published in French three scientific essays on optics, geometry, and meteorology. He was bypassing scholastic Latin. He also published in French his Discourse on Method. In this work Descartes elevated the “light of reason,” credited with the ability to distinguish between truth and falsity. That Discourse also emphasised a major difference between animals and humans; the distinction has since become a major source of disagreement. Descartes presumed an absence of mind in animals, comparing them to clock mechanisms. In 1641 he published in Latin his Meditations on the First Philosophy; this became his most famous work. That book aroused objections from leading scholars and theologians. The author was basically in friction with Scholastic philosophy. Employing a “method of doubt,” Descartes professed to arrive at certainty about his own mental existence and that of God. He supplied proofs for the existence of God, but these were treated as atheism by some theologians. His opponents included Calvinists. In 1644 appeared his Latin work Principia Philosophiae (Principles of Philosophy), which restates his version of metaphysics and also his mechanistic physics. Descartes was in conflict with the Jesuit theologians or Late Scholastics, for example, Francisco Suarez. He was effectively pitched against Aristotle and Thomas Aquinas. In 1648, the curators of Leiden University confirmed their decision that only Aristotelian philosophy could be taught in their precincts. Professors in that establishment were forbidden to mention the name of Descartes. The commentator has to be fair to the subject while observing his defects. 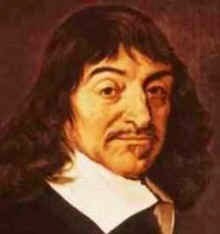 Descartes was a mechanist who believed that he had evolved a perfect rationalism. This can be strongly queried, especially in view of the crude empiricism that emerges in the record of his activities. Such actions were part of his insensitive approach to the issue of animal consciousness, encapsulated to some extent by his notorious theme that “animals are machines.” Descartes has been described as a pioneer of vivisection; he was by no means the only one. His ideas on this subject reflected theological dogmas that animals had no soul. He was also in conflict with the trend of scepticism represented by Montaigne. From another angle, an English royalist, namely William Cavendish, in 1646 sent a letter to Descartes about the apparent ability of animals to think. The recipient made what appears to have been a reluctant concession (Clarke 2006:336). However, this occurred during his final years; the concession did not alter his basic standpoint. The Cartesian version of “cosmology” was not comprehensive, but acutely reductionist. His earlier letter to Plempius in February 1638 affords proof that he practised vivisection (Cottingham 1991:79-85). Descartes here described his vivisection of a living rabbit. Descartes also “wrote in correspondence that the mechanical understanding of animals absolved people of any guilt for killing and eating animals” (Animal Consciousness). His category of belief was very convenient for vivisectionists. The “scientific” followers of Descartes, meaning Cartesians, have been criticised as the brutal precursors of laboratory practices, which continue to masquerade as a perfect empirical science confounding the subject of animal ethics. Jesuits at this period may also have practised vivisection; certain references have been debated. A systematic approach to the theories of Descartes, on the part of his posthumous followers, led to much confusion. This party were reacting to religious censorship and Jesuit opposition. Nicolas Malebranche (1638-1715) was an influential neo-Cartesian mechanist who argued on religious grounds that animals lacked a soul and were incapable of pain or suffering, therefore being beyond any moral consideration. Some commentators express uncertainty as to whether Descartes himself believed this (Boden 2006:72). The fact is that Descartes performed animal experiments, and recommended others to do so. Descartes ascribed sentience to animals. However, in contrast to Aristotelians, he explained sentience in mechanistic terms, eschewing concepts of a “sensitive” soul (Boden 2006:72). In his Discourse on Method (1637), Descartes stated that the divine gift of the soul distinguished humans from animals, even though all of these beings were machines. Scientists found in his writings a reason to discount the behavioural response of animals to vivisection (Monamy 2009:10-11). In 1629 he relocated to Amsterdam, then a new centre of anatomy, a rather fashionable Renaissance subject which he embraced. Descartes lived for a period in the Kalverstraat quarter, inhabited by butchers. He regularly visited the butcher stalls. While reading the works of Vesalius, he would purchase animal carcases, and carry these back to his flat for dissection. In a letter of 1639, and after moving to other places, Descartes told Mersenne that he had spent much time in dissection for eleven years (Sawday 1995:147ff; McCance 2013:48-9). Such activities are questionable in the pursuit of a viable philosophy, despite the associations of a scientific revolution. Descartes was basically an empiricist, gaining disproportionate fame as a deductivist, an avenue in which he was at some disadvantage via his estrangement from nature. In 1632, Descartes wrote to Mersenne: “I am now dissecting the heads of various animals, so that I can explain what imagination, memory, etc. consist in” (Gaukroger 2000). His bland assumption, in respect of explanation, may be regarded as imaginative rather than anything more comprehensive. Descartes was preoccupied with both human and animal corpses and made “many post-mortem dissections.” He frequently visited abattoirs and the gallows (criminals were dissected after hanging). Not knowing where to stop, he followed the example of William Harvey (1578-1657) in vivisecting a few animals: fishes, eels, and a hare (Boden 2006:61). He describes the vivisection of a dog in his Description of the Human Body and of All Its Functions. Descartes does not there say that he performed the operation. However, some commentators have very feasibly construed that he did. Arguing against Harvey, the philosopher scientist affirms: “If you slice off the pointed end of the heart in a live dog, and insert a finger into one of the cavities…” (Cottingham 1985:317). The passage can easily offend dog lovers. “There is no point in denying that Descartes’ vivisection and ill-treatment of animals is disgraceful” (Grayling 2006:159). The issue does not stop there. According to Richard Dawkins, Descartes “stood in a long tradition of vivisectionists including Galen and Vesalius, and he was followed by William Harvey and many others” (On Vivisection). His inspirer Vesalius was keen on both the dissection of human corpses and animal vivisection. Vesalius (1514-64) authored the influential De humani corporis fabrica (1543). The word vivisection was not invented until 1702, and the earlier word dissection can be equivocal in context. Some reports state that the ancient Greek practitioners Herophilus and Erasistratus vivisected (live) human beings in their version of anatomy at Alexandria. Celsus and Tertullian relate that Herophilus (335-280 BC) vivisected at least 600 live prisoners. As a philosopher, Descartes ought to have been more resistant to fashionable cruelty of the leisured scientist class in his time. His inclination to the contrary places him in the same category as reprehensible 1660s events: thirty vivisections were conducted in the presence of assembled members of the Royal Society in London. A well known report of brutal and callous Cartesians at the Port Royal school “may not be trustworthy.” That account was written years after the supposed events described; the author regarded Cartesianism as a blasphemy. However, there are other reports of animal experiments in the late seventeenth century, along with implications that Cartesian mechanists made no attempt to minimise animal suffering, believing that this was an illusion (Boden 2006:72-3). Vivisection increased substantially as a consequence of Cartesian doctrine, and was avidly practised by the Royal Society. This organisation was founded by a group of scientists who included Robert Boyle (1627-91) and Robert Hooke (1635-1703). Their crimes are on record, including the injection of poisons, ever since a favoured device of laboratory personnel. Dogs, sheep, and other animals were the victims. Hooke is known to have vivisected a dog in 1667, and in this respect was a blood brother of Descartes. Hooke’s prestigious colleague Robert Boyle was an ardent defender of vivisection, viewing critics as sentimentalists. How tough and supremely insensitive the empiricists were. The objectors were here viewed as “a discouraging impediment to the empire of man over the inferior creatures of God” (Boden 2006:73). The empire of man, considered so desirable by Boyle, was strongly convergent with the developing inclinations for a colonial empire. The successors of the Romans (and the abominations of Galen) were eager to assert their scientific superiority over the supposed barbarians in the East (and the Americas). The superiority, and the declared achievements, can be strongly questioned. The mechanist use of brute force is no proof of cultural redemption. Boyle was a hero of the empiricist philosopher John Locke (1632-1704). The vivisectionist outlook evidently did influence Locke to some extent. An episode is reported, dating to the 1650s, of how he skinned a frog to prove circulation of blood. Though a mere scratch compared to agonies devised by the Royal Society, this detail may afford some reason to doubt Locke’s overall ability to chart the dimensions of human understanding in an empiricist straitjacket. A century after Boyle, the essayist Samuel Johnson (d.1784) complained about the “arts of torture” practised by some medical men, whose favoured pastime was “to nail dogs to tables and open them alive” (Boden 2006:73). Johnson was an opponent of slavery and a lover of cats. Elite members of the Royal Society continued experiments on live frogs, dogs, and horses. In more humane channels, the English gained a contradictory reputation as horse lovers. The clergyman Stephen Hales (1677-1761) was a partisan of Newtonian science at Cambridge. In 1714 he conducted dubious experiments on horses and dogs. Hales was elected a Fellow of the approving Royal Society in 1718. He afterwards turned his attention to plants and philanthropy, but continued to be praised for bleeding a sheep to death while measuring heartbeat. Not until the 1870s was official action taken to limit disturbing laboratory practices. The substantial continuation was not considered satisfactory by the National Anti-Vivisection Society, founded in that same decade. Bibliography: Boden, Margaret A., Mind as Machine: A History of Cognitive Science Vol. 1 (Oxford University Press, 2006); Clarke, Desmond M., Descartes: A Biography (Cambridge University Press, 2006); Cottingham, John, et al, trans., The Philosophical Writings of Descartes (3 vols, Cambridge University Press, 1985-91); Gaukroger, Stephen, et al, eds., Descartes’ Natural Philosophy (London: Routledge, 2000); Grayling, A. C., Descartes (2005; London: Simon and Schuster, 2006); McCance, Dawn, Critical Animal Studies: An Introduction (Albany: State University of New York Press, 2013); Monamy, Vaughan, Experimentation: A Guide to the Issues (2000; second edn, Cambridge University Press, 2009); Sawday, Jonathan, The Body Emblazoned: Dissection and the Human Body in Renaissance Culture (Abingdon: Routledge, 1995); Shepherd, web article Rene Descartes Philosopher and Scientist (bibliography).